Specialising in wedding gowns, bridal dresses and formal suits, Penrith Bridal Centre is NSW’s award-winning boutique guaranteeing superb quality, impeccable service and value for money. Undeniably romantic and glamorous, wedding gowns by Corston Couture will make you look and feel truly special on your big day! Adelaide's premier bridal boutique offers modern and unique wedding gowns to brides searching for something a little different. Beautiful custom-made wedding gowns by Betrothed are crafted from finest bridal fabrics sourced from around the world! Rhonda Hemmingway specialises in making superbly fitted made-to-measure wedding gowns and occasion dresses. Inspired by the timeless elegance of the greatest French fashion houses, Sydney Bridal Store, Maison Mangala selects finest wedding gowns to shape the vision of a postmodern bride. Macarthur Brides offers a curated selection of exquisite wedding gowns sourced from bridal fashion designers across the globe. Mikaella Wedding Dresses are inspired by youthful, free-spirited women who want to add a little fun to their wedding. A Bridal Affair offers a wonderful range of wedding gowns and bridesmaid dresses from renowned Australian and international designers! Established 25 years ago, Sydney-based Bizzaro Bridal Couture studio specialises in exquisite hand-crafted and made-to-measure wedding gowns. Located in Melbourne’s famous fashion precinct, Always And Forever is a leading bridal store offering award-winning designs by Australian and international brands. Annabel’s Bridal Studio prides itself on a stunning selection of wedding and bridesmaid dresses sourced from the best European, American and Australian designers. Offering an impressive selection of bridal and bridesmaid dresses made by Australian and international designers, Canberra’s largest store has just the right style and the right size for every bride! Inspired by the 1950's fashion, Lena Kasparian's bridal collections are revamping iconic Parisian style and old Hollywood glamour! Let your mums shine on your big day in stylish outfits by Ever Elegant, Australia's biggest mother of the bride boutique! DK fabrics have South Australia’s most extensive range of beautiful fabrics, laces, beaded trims and motifs to create any bride’s dream gown. Whether you want a one-off gown straight from the runway or a bespoke piece designed and tailored especially for you, Alexis George will make sure you get the perfect dress for your big day! 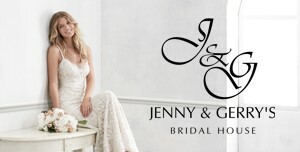 Jenny & Gerry’s Bridal Centre is your one-stop bridal store in Adelaide where you will find a wonderful range of wedding gowns, groom suits, bridal party attire, wedding stationery, bomboniere and decorations.